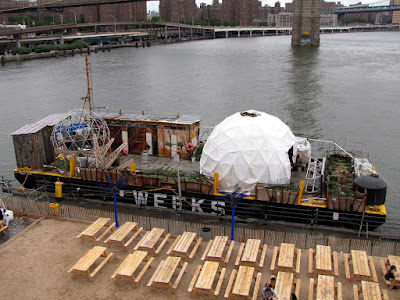 A couple of weeks ago I went to the South Street Seaport and visited the experimental project the Waterpod I mentioned in a previous Reading Round Up. The public wasn't allowed on board, but I didn't feel too bad about that since just watching the barge bob up and down in the water was enough to get me queasy. It's pretty cool, I'm definitely going to visit it again. I kept all the pics at a high resolution so click on each one if you want to get a closer look. 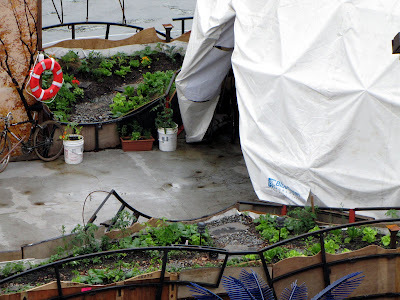 In the above pic I see chard, lettuce, corn maybe. Some scrawny tomato plants, lettuce, other stuff. 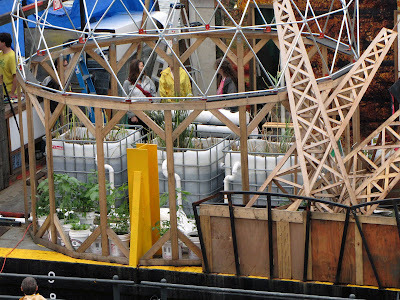 Those big, white vats are part of their water filtration system, but what's growing in the 5 gallon buckets? My plant id skills do not extend far. What do you see in these pics? Hey, that's pretty cool. 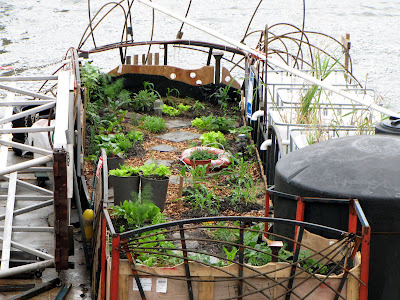 A garden on a ship. Some people have all the fun! I think I see rosemary in the window box between the two buckets. In the planted area above that I definitely see nasturtiums. I see the corn too, is that fern-like stuff dill? I see some sunflowers in the pic with the corn. Not 100%, but it appears to be sunflowers in the buckets, its also in the garden area. Wonder how the salt spray is affecting their plants over time? Cut off from the dry world, seems like bare survival, and imminent death. Fortunately, its not for real. Hi NYC Garden. I remember reading that the NYC Waterfall Project really hurt the neighboring trees with their salt spray so these guys might have a similar problem. I would say most vegetables can't tolerate salt spray. We'll see how it goes. If it ain't windy, probably ok.